A common misconception about steel buildings is that they are not pleasing to the eye; but did you know you can modify your steel building to suit your tastes? While we think our buildings are a work of art in themselves, there are many customers who choose to go with a custom finish for their steel buildings. There are a variety of finishes to choose from that are both inexpensive and pleasing to the eye. Depending on the look you would like to achieve, you can customize the end walls of your steel building using steel and/or wood. You can even finish them off with vinyl or aluminum siding. Not to worry, customizing your materials won’t compromise the ability to add windows and doors if desired. Customization also doesn’t limit you to making sure your steel building is climate controlled, should that be what you wish. Before the end walls are finished, conventional methods can be used to achieve the desired insulation. Many people opt to have their new Future Steel Building match the exterior decor of their home, or coordinate the colors. You can also add shutters, skylights, custom doorframes, and any other attractive exterior feature you wish. 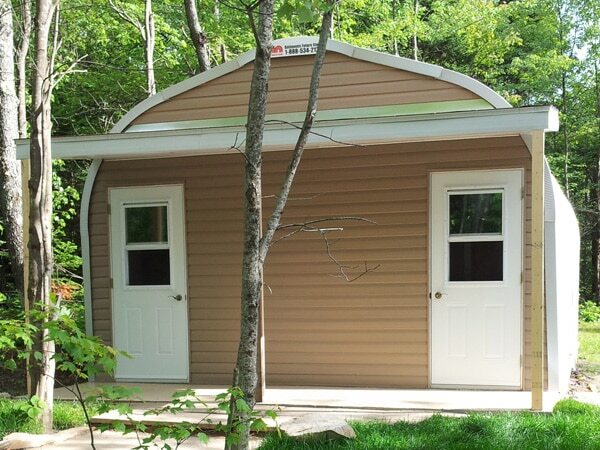 Another option that some of our customers choose is to have a covered area in front of or beside their steel building. For example, if you’re thinking of a steel building to act as a shed or pool house in your backyard, a covered area could prove to be perfect for sitting and relaxing during a hot summer day. In addition to adding shade, an awning or roof extension also makes for a great focal feature. In addition to being able to customize the outside of your steel building, keep in mind that you can also decorate the inside however you’d like. Because our steel buildings can be insulated the same way a home is, they can turn into just about anything inside. You can add skylights, fireplaces, built in shelving or storage, the list never ends! We have even had customers turn their steel building into an amazing modern guest/in-law suite building. With endless customization options, the sky really is the limit when it comes to decorating your steel building. If you would like some ideas or starting points on how you can customize your steel building, please visit our Custom Building Finishes page on our website, or call us today for a free quote 1-800-668-5111.